-Frit 3195 and Ravenscrag slip (2.5 kg. each). Frit is a powdered glass (while mixing any dry products a respiratory mask is recommended). -Stains. A variety of colours to enable children to paint base coat designs. Stains vary in price. -Junior 04 cones. To bisque fire projects and glaze. Slip recipe to colour or decorate on clay surface. 30 grams of coloured stain. Mix with water to a cream like consistency. Apply on wet, dry or bisque surface. Mix in smaller containers so children can share at separate tables. 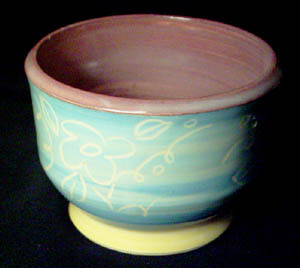 Some teachers have allowed children to decorate their projects with coloured slip and then bisque fired to cone 04 (they skipped glazing the projects). You would not get a glossy finish nor would the clay be sealed or capable of holding water or food, but for some hand-building projects that would not be a problem. -After the projects have been created, allow the children to decorate the surface of the clay with coloured slips. If there was not enough time in one class to do this, their projects can be painted when the clay has dried. -Clay shrinks 5% to 7% and, to prevent cracks from occurring, it is best to allow the clay projects to dry out on newspaper and cover with a light, dry cleaner's plastic for the first couple of days. After a couple of days, take off plastic and let air dry. Encourage even drying by turning pieces over once or twice (if the shape allows it). -If you used any type of form inside the clay like a cardboard tube, remove it, or the clay will crack as it attempts to dry around the object. Use a layer of newspaper or cheese cloth between form and clay so it is easier to remove the form. -Mix glaze and slip well (with an electric mixer if possible). -When brushing on glaze, try to achieve an even layer on the bisque. Paint on one coat and allow to dry before applying the next coat. Two to three coats should be good. One coat would be too thin. -For dipping, make sure the glaze is not too thick. It should be approximately the thickness of a credit card. 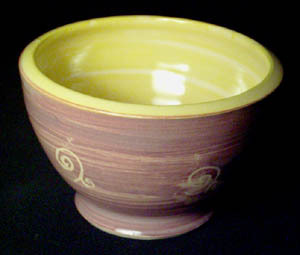 -Clay projects can be bisque fired to cone 04 and glaze fired to cone 04 as well. -For a better melt, glaze can be mixed with 60% Frit 3195 and 40% Ravenscrag. You would need a scale to weigh the material. $7.40 box of Jr. 04 cones. Although this costs slightly more than buying premixed glazes it provides more versatile decoration process and much more glaze. This is fired at cone 04. It is Buffstone clay with Ravenscrag:Frit 3195 50:50 glaze over stain colored slips. There are many things to know about to make the best use of stains, but one often ignored aspect is the relationship between glaze color and chemistry. If you want to control color you need to know about stains and chemistry.